With materials in hand, it’s time to start the actual work. First step is to create the mouth, bedding surface for the iron and front escapement area for the shavings. For infill bench planes, the wood can be cut completely apart and held on with the two metal sides during final assembly. Since this shooting plane only has one metal side, that strategy is not a good possibility. 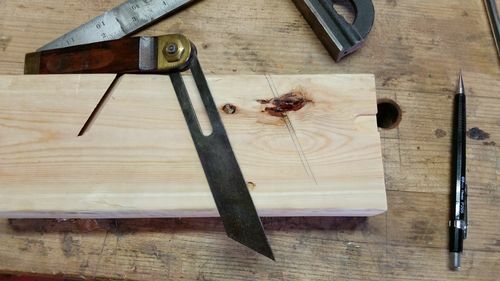 With many wooden plane builds, making this opening requires either chiseling out the area or doing a Krenov style plane by cutting off the sides and gluing them back on. For this build, I came up with a way to more easily create the void by utilizing the characteristics of a shooting plane. 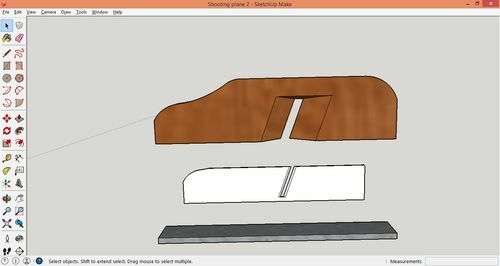 Looking at the exploded Sketchup file, you can see that the channel can be cut from one side of the wood blank. The metal piece that is the base will end up supporting the wood. Kind of a hybrid approach of infill on one side and the wood body chiseled out on the other, but able to be done much easier than either. Layout is pretty straight forward. Before doing any layout, make sure that you have a perfectly square corner on the wood blank where the two metal pieces will meet. This will be essential in having a good performing shooting plane. Note: I did the layout and took pics of the process on the jatoba, but the layout lines didn’t show up very well in pics because of the color of the wood. In order to better show the process, I retook the pics, using a short piece of scrap 2×4. Bedding angle of a transitional plane is 45 degrees, so that will give us the first angle. 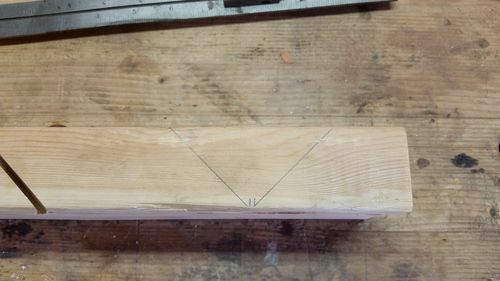 Flip your wood blank so the narrow, bottom side is facing up. The mouth on the plane needs to be about 1/3 of the way from the front of the body. So for our 15 inch long plane, measure back a little over 5 inches and make a mark on the side that will be the mouth. (Your wood blank is still a bit over long, right? Even a 1/2 inch or so is enough) Make another mark about 1/8 in front of that one and then mark out 45 degrees each way. Front of the plane is to the right in this pic. Note: All layout is being described and shown for a right handed user. For you lefties out there, just mirror image everything. Turn the wood blank so that you are looking at what will be the wide side of the mouth opening. For best performance, you want a skewed cut. A couple reasons for this. 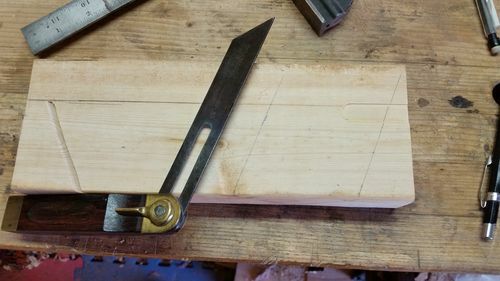 First is that skewing the cut reduces the effective cutting angle by a few degrees, which helps cut through end grain. The second, and IMHO more important reason, is that having a skewed cut forces the workpiece down and into the fence of the shooting board, which helps hold it in place when shooting. The skew angle is not critical, but I use 20 degrees as a guideline. 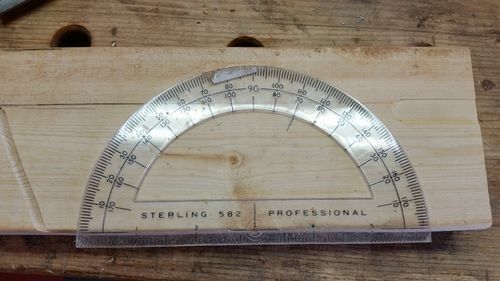 It’s a simple matter to mark out the angle using a protractor or speed square, with the line going from the mouth opening and angling toward the front of the plane. 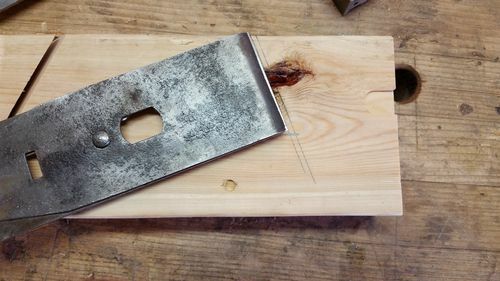 A sliding bevel can now be set and used to transfer the marks. Flipping the blank over to the mouth side, we can use the bevel to mark the mouth, as well. Double check to make sure that the angles on both sides are going the same direction. Final piece of layout is to mark how deep the cut needs to be. Take the iron, line up the cutting edge with the mouth opening lines and mark the depth. You’ll want to add about 1/8 inch to allow the iron to make lateral adjustments in use. 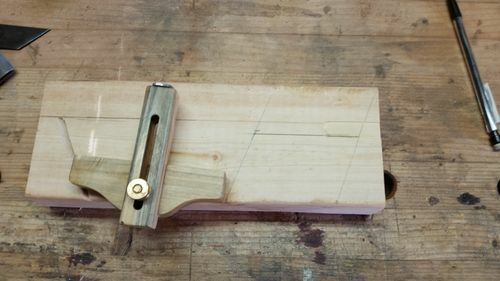 A marking gauge can be used to transfer this dimension to the top of the blank. That’s the basic layout. It took far longer to type out than to do. Next up: Opening the mouth.